Interview with Caroline Lee, Shoes Designer turned Children's illustrator! 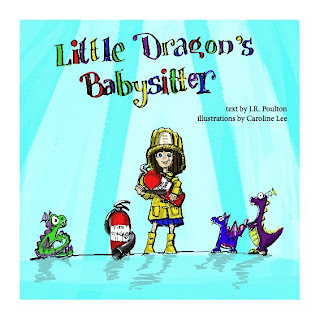 Caroline and I have just launched our digital picture book collaboration on Utales. 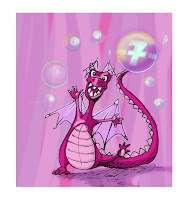 It is called "Little Dragon's Babysitter" and is a humorous narrative verse story with a counting element. This is Caroline's first picture book and my 7th digital book. Question: Caroline, you are living every woman's dream - designing shoes to die for! 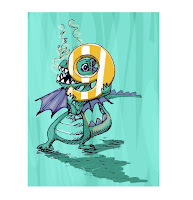 Tell us about why you decided to add illustrating children's books to your resume? I have always liked drawing in its own right, vs. drawing for the execution of a design. I still enjoy designing, and will always love shoes, but it's also nice to be able to just simply draw, especially since becoming a mother. My daughter loves drawing and painting, so it's something that we can do together. 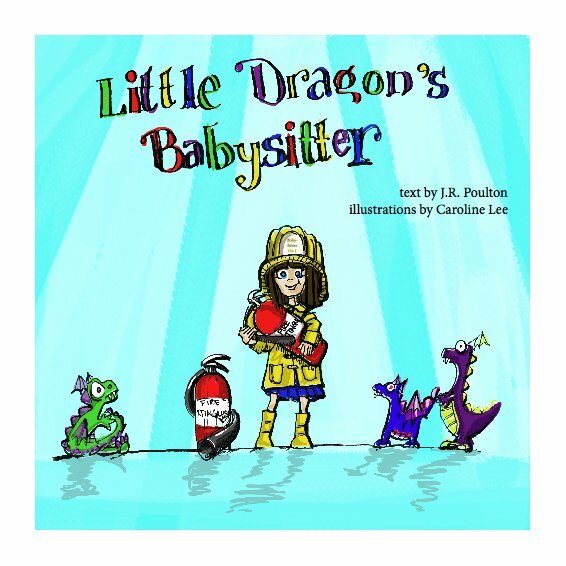 Question: What drew you to the text of "Little Dragon's Babysitter"? Jennifer sent me two really lovely stories, one which was about a turtle and the other about little dragons. 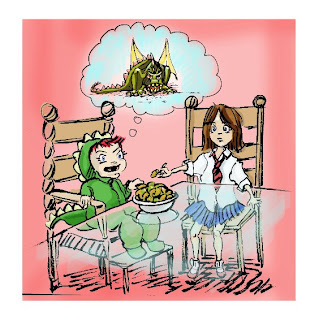 I chose the dragons in the end, because I liked the counting element, and I liked her little side comments, which established a humorous point of view to what could otherwise be a scary story for children. Question: How did you decide to tackle the illustrations? What decied you on the medium to use? As I felt that the story was humourous, I decided to use pen and ink for its boldness, and added colour via Photoshop, as digital colours for me fit the final product, an eBook. I thought that the two combined would give a handmade but modern look that fit Jennifer's story. 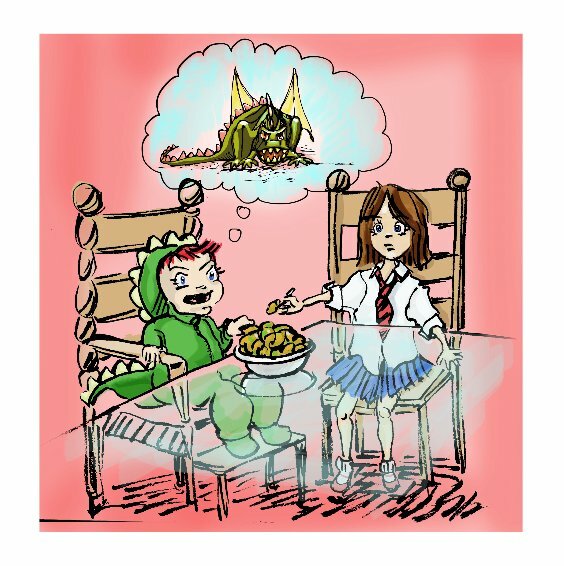 Question: You have added an illustrative subplot to the story that is very effective, combining the story of the little dragons, which you have made into toys, and the story of the little girl who babysitting a toddler who has more than a passing resemblance to a little dragon! :) How did you come up with that? What inspired you? That is the subtext that I myself read in the story. Maybe I should have verified with Jennifer that this is what she meant ! :) This interpretation was probably influenced by my own experience of having a toddler my daughter was three when we began working together and had just begun becoming a bit more reasonable and easier to manage. During her terrible twos, one of my nicknames for her was 'Beastie', or 'the Beast', because she could be pretty nightmarish at times! Questions: You have also just illustrated the story of a friendship between a blind girl and her schoolmate. How did that come about? When Nessa Morris joined the utales community, she said she was looking for an illustrator for her story about Amelia, a blind girl who describes her experience of colour to her friend, Betsy. I thought it was a lovely idea, so I wrote to Nessa saying I was interested, and sent her some of my work samples from Little Dragon's (minus the text, to protect Jennifer's privacy). Colours are such an important part of children's lives in the early stages of development, and the idea of showing them through the 'eyes' of a blind girl for me, was truly inspired. I hope she continues to write other stories that relate to her work in this field. Question: Finally, What are you working on next? My workload got really busy after finishing Reaching for Rainbows, so I had to take a hiatus from illustrating. I have however, recently gotten back on track and am collaborating with a writer named Canidlynn Fite on a story about a nut. THis time, I am going to try using watercolours to see if it works with the story; if not, I will probably go back to my favourite medium of pen and ink with digital colours. Thank you Caroline! Our collaboration was great fun and I love the way you brought out the humour in the story! And more about Caroline and her work via this link: http://www.spielplatz13.com and http://www.spielplatz13.tumblr.com for my tumblerlog. Wow!! It was really a Nice post. i like it. I also want to share something with the visitors of this owesum post.